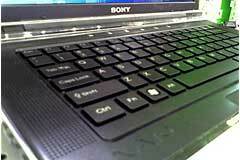 Sony VAIO Taking a Lesson from Apple's MacBook? "You're out and about, and you know you'll need to hook back to the office to pick up that important email or access that corporate system - so what do you want to take, a notebook or a handheld device? "To our surprise, according to over 1,000 of you, compared to mobile access via a handheld device, remote notebook access was twice as likely to be broadly relevant across the workforce. The distinction is less profound in the smallest of companies, but of course this means that it is even greater for larger organisations. Link: And the Winner Is . . . the Laptop! "It's a whole new camera. - Really! "It has a new USB PID. What I'll henceforth have to refer to as the original built-in iSight, had the USB Product ID: 0x8501 and reports its manufacturer as Micron. The new built-in iSight has the Product ID of 0x8502 and reports manufacturer of Apple Inc.
"After fighting our way through the crowds of people asking if they can pre-order an iPhone, we commandeered some MB Pros. - The same test program produced a nice, big 1.3 MP (1280 x 1024) image...."
Laptop with Mail, IM and other communication/organization stuff. Server with Bit Torrent downloading, media serving and distributed rendering. Gig machine with just Resolume and required codecs. "Since this whole tour thing started I've had to consolidate everything onto my MacBook. All of the usual amail [sic], browsing and IM duties remain, but are now encroached by editing in iMovie, flyer and poster design in Photoshop/InDesign, web administration and coding in Coda, Tour and Gig organization with NeoOffice, photo organization in Lightroom... My poor MacBook has been flogged half to death, with constant slowdown and frequent freezes and crashes. Quicksilver especially - my Mac raison d'tre - has been having huge problems." "Yesterday, we brought you a commentary on how the 'CR Series' of Sony's VAIO laptops bore an uncanny resemblance - if not an exact clone - to Apple's black MacBook line. It was timely because one, the laptop that caught our attention is on sale this week at Best Buy stores, and second, AppleInsider.com reports that the new iMac revision will also bring with it a new Apple keyboard... a low-profile style like that found on the MacBook. "So last night, we embarked on a little journey to see for ourselves whether the keyboard on Sony's VAIO laptop was a clone of Apple's MacBook notebook. The results were jaw-dropping." Link: OK, Is It a Sony MacBook or an Apple VAIO? "CrunchGear reports that Apple will roll out slimmer MacBooks with iPhone-like multi-touch functionality built into the touchpad later this year. This of course begs the question that most Mac fans have pondered for a couple of years now: When will Apple release tablet computers?" "Apple's much-rumoured ultra-skinny MacBook Pro sub-notebook has reared its Flash-filled fascia again, this time in a story suggesting the unit will sport a 12.1in screen and less than three-quarters of an inch thick. "Beyond that, MacScoop's report has little to add. Its mole maintains the svelte laptop could appear by the end of the year, slightly better than the 2008 timeframe previously claimed. "If this thing exists, our money's on a Macworld Expo unveiling in January 2008...."
"A little while ago I was given an iBook with a faulty screen (as in not working at all). "Having a hard time just throwing it away, I was looking for a way to put it to use even though it was a fairly old 500 MHz G3 iBook. "Things being as they were, I thought the only thing to do was using it as a server even if it would mean quite a makeover - hence the fun. "First of all we need to take the iBook apart to remove screen, optical drive and battery. All of these aren't necessary since we are building a server. "But what about restoring of OS X - don't we need the hard-drive for that?" Actually, you don't, since you can do it just as well in target mode from another hard-drive. Another thing we need to keep in mind is that we really want to keep the footprint of the iBook as small as possible. "Before taking an iBook apart I strongly recommend visiting ifixit's guide on how to disassemble an iBook so that nothing unintentionally gets broken." "Peter Presti sent us some tips for keeping a MacBook Pro cool when booted from Windows Vista using Boot Camp 1.3 beta. "He did not have the serious keyboard and booting problems that others have been reporting with version 1.3, but recommends a Windows utility for finer controls with keyboard settings. Presti did report an issue with external displays and found USB to be slow." "The new 15-inch MacBook Pro is the first laptop we've seen to use Intel's new version of its Centrino platform, codenamed Santa Rosa. "Santa Rosa offers slightly faster processor speeds than the Intel's previous Centrino - so instead of a choice of 2.16 GHz and 2.33 GHz chips you can now choose from 2.2 GHz and 2.4 GHz models. Our review unit features the 2.2 GHz Core 2 Duo T7500. The new processors communicate with the rest of the components faster, through a front-side bus (FSB) that been upped from 667 MHz to 800 MHz. "The end result is more than the minute speed bump that you would expect. The new 2.2 GHz model was slower at After Effects video rendering and Cinebench 3D rendering than the 2.33 GHz model we looked at in our June issue - but much faster than the 2 GHz Sony Vaio FE41Z we looked at in the same group test." "MacBook Pro is built on the revolutionary Intel Core 2 Duo which packs the power of two processor cores (up to 2.4 GHz) inside a single chip. It provides 4 MB of Smart Cache, L2 cache that can be shared between the cores as needed. It delivers higher performance in 2D and 3D graphics, video editing, and music encoding. But the faster engine is only part of the story. MacBook Pro delivers up to 4 GB of 667 MHz DDR2 memory with a faster, 800 MHz frontside bus and support for hard drives up to 250 GB. Ultimate speed, performance, and connectivity. To go. That's MacBook Pro. This update provides important bug fixes and is recommended for all 2.2/2.4 GHz MacBook Pro models. "This update requires Mac OS X 10.4.9 or later. MacBook Pro 2.2 GHz or 2.4 GHz"
Editor's note: MacFixIt is reporting that Apple SuperDrive Update 2.1 for MacBook or MacBook Pro is, if the installation does not proceed perfectly, killing optical drives. PR: Nowadays, there are plenty of laptop mice that try to offer solutions for traveling and are supposedly designed for working "on the road". But external laptop mice tend to be extremely small and therefore significantly uncomfortable to use. The slim portable G4 mouse is the only laptop mouse that can be transformed from a mouse-for-packing to a mouse-for-working. Slim G4 Optical Mouse online store - the only 5 mm thin, slick, external USB mouse that twists open to a stable, surprisingly comfortable to use, ergonomic mouse in only 10 seconds. The G4 slim laptop mouse opens up to a full-size, smooth operating, working-horse-mouse with a strong and durable metal and rugged plastic body, built for an extensive, long-lasting usage. Its touch-scroll pad prevents accumulation of dirt, dust or sand and its cable-hiding mechanism protects the USB cable from tangling, tarring and disconnecting. G4 slim portable mouse is claimed to be the smallest, thinnest, most elegant accessory you can imagine possessing. 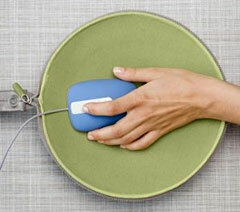 When ready for mousing it flips into a strong, stable, hand-fitted laptop mouse. This portable mouse is a perfect solution for those of you that can't stand using the trackpad and that find the little travel mice just too small to operate. It features an easy scroll operation that allows rapid and effortless navigation by just gently sliding a finger on the smooth center touch-scroll wheel. It is stable, durable and comfortable to use on any solid surface. If you don't like using the trackpad and the little travel laptop mice are just too small, you will will find the G4 slim portable mouse most suitable in style and comfort level. The G4 slim laptop mouse is based on a new optical module technology awarded for its excellent design by the Korean Government in October 2006. This Unique double featured portable mouse is slim, flat, easy to carry and saves space when traveling, yet it twists open to a strong, 3-dimensional, arched structure for mousing. The G4 slim portable mouse features an easy scroll operation that allows rapid and effortless navigation by just gently sliding a finger on the smooth center touch-scroll wheel. It is stable, durable and comfortable to use on any solid surface. The G4 slim portable mouse has a steady structure and does not "lean" on a fragile "kickstand" when open. It's also a length adjustable laptop mouse and therefore fits all sizes of hands. This slim laptop mouse fits all laptops - PCs and Macs - by a USB connection. Just "plug" it in and "scroll on". When not working, this ingenious slim portable mouse hides the USB cable neatly under its surface - so there are no torn or mixed up cables. Light weight laptop mouse: 43 gr. A unique double featured laptop mouse - slim, flat, easy to carry and saves space when traveling. It twists open to a strong, 3-dimensional structure for mousing. Stores in your memory card slot (or inside your smallest pocket). Steady structure - does not "lean" on a fragile "kickstand" when open - easy to work with for hours. A length adjustable portable mouse - fits all sizes of hands. Easy scroll operation for rapid navigation - just gently slide your finger on the smooth center touch-scroll wheel. Comfortable left and right buttons (won't break or get stuck after no time). No torn or mixed up cables - the retractable USB cable stores quickly and neatly under the laptop mouse surface. A Schick, origami-like, luxurious designed slim portable mouse (like no one else has...). Comes in 4 different colors to choose from. Much easier to operate than the tiny laptop trackpad (even if you played the piano as a kid or have really small hands...). Freedom of movement - as you work long hours with your portable mouse, you'll find that your hand and back are more relaxed. This G4 portable mouse enables freedom of movement that makes your hand and back feel more relaxed. This Schick, origami-like designed slim portable mouse comes in 4 different colors to choose from, a pad and a luxurious leather jacket. PR: LapWorks Inc., the market leader in ergonomic and heat- reducing laptop desks, stands, and accessories today announced a fashion-forward addition to its Laptop Desk family - the Laptop Desk Futura. Like its Laptop Desk 2.0 and UltraLite siblings, the Futura's dual-purpose design provides an ergonomically-sound workspace across the lap, and folds into a wedge-shaped stand for desk use. An oval-shaped burst differentiates the chic Futura design, and it will be LapWorks' first laptop cooler to come optionally in fashion colors in the coming months. The initial units, in modernistic 'gunmetal' gray, retail for $29.95 directly from LapWorks. To improve laptop cooling over previous designs, LapWorks 1) created open ventilation slots which were previously closed channels so cool air can enter from under the Futura, 2) elongated these slots by 2 inches so hot air has a better pathway to escape from under widescreen notebooks, and 3) created a 1/8-inch air space to let cool air circulate under the notebook with rubber pads that lift and separate it from the Futura. "In the next three months we plan to offer the Futura in bright, modern, hand-painted colors similar to iPod/MP3 player skins," said Jose Calero, LapWorks' president. LapWorks also plans to offer customized Futura paint jobs. All colors - hand-painted and customized - will be offered at premium prices. "Some of our customers have asked when we might have a trendy Laptop Desk, so we are dipping our toes into the fashion fountain with the Futura," Calero explained. The Laptop Desk Futura weighs just over a pound (16-1/4 ounces), and folds in half to 11 x 10-3/4 inches and one-half of an inch thick for easy traveling in any computer bag. 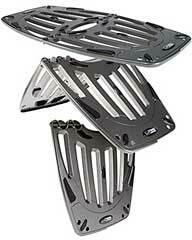 It is constructed of high-impact ABS plastic, and carries a one-year warranty. "The Futura's design takes better advantage of the thermal dynamics of heat rising to cool notebooks," said Calero. "The moment hot air radiates from the bottom of a notebook, it travels laterally looking for the quickest way to rise. The new open, elongated slots let cool air in from the bottom to mix with and begin cooling the hot air seeking its way out and up. Additionally, we are confident that the Futura will not absorb sufficient heat to overheat and radiate heat downward, which is good news for the lap." The Futura retains key design features of the award-winning, dual-purpose Laptop Desks v2.0 and UltraLite. As a lap tray, the Futura unfolds into a wide, 21 x 11 x 3/8-inch workspace. Ergonomist Sally A Longyear, CIE, MPH, uses LapWorks' wide-span lap desks to demonstrate correct posture. "LapWorks' Laptop Desks span the entire lap so you can relax your knees naturally instead of squeezing them together to balance a laptop," Longyear says. "This minimizes strain on the shoulders, neck, back and arms." 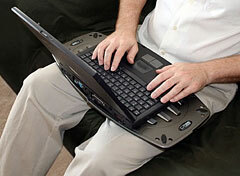 This illustration shows correct laptop-using posture on a desk and on a lap. As a desktop stand, the Futura folds into a wedge shape that offers 5 typing angles that incline the notebook's keyboard for more ergonomically comfortable use than when set flat on a desk. It also elevates the screen 3 3Ú4 inches closer to eye level at maximum incline to reduce neck strain. Because of the limited mousing space on the Futura, customers who prefer an external mouse when using a laptop on their lap should consider the Laptop Desk 2.0 or the slightly longer, yet lighter Laptop Desk UltraLite, which was designed to support notebooks weighing less than 5 pounds. Later this year, LapWorks expects to offer a snap-on MouzPad to expand the Futura's mousing area. "The External Serial ATA (eSATA) add-on interconnection standard is becoming more common on systems as users seek greater data transfer speeds. Macs are often among the first to get new technologies like these, but eSATA ports remain absent. 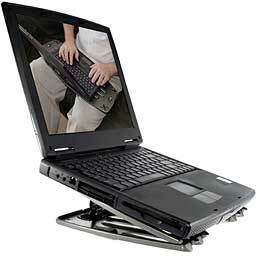 For ExpressCard 34-equipped laptops at least, here's one answer. "Sonnet's Tempo SATA Express 34 comes without any eSATA cables - it's the same thing as a SATA II link - so you'll need to spend an extra eight quid on one of those if your hard drive doesn't have one either. None of the drives we tested with the Tempo did. "The card has two ports, so you can hook up at minimum two drives. Want more? Then hook up a drive enclosure that contains a port multiplier - such as Sonnet's own Fusion series - and you can connect up to ten drives. Initially, we only had access to a single drive, a 750 GB Seagate FreeAgent Pro, so our first tests are based on that, more basic configuration." PR: In an airport, on a train, or a busy hotel lobby, the Plantronics .Audio 480's sophisticated features and cool profile make life on the go more enjoyable. The flexible boom lets you bring the microphone close for private conversations. Sound-isolating earbuds block out unwanted noise, allowing you to immerse yourself in rich stereo sound. Callers benefit too - a noise-canceling microphone minimizes external noise, making it easier for them to understand you. When it's time to be on your way, the headset folds and fits easily into a crowded briefcase. A quiet oasis in the midst of clamor. That's better. Easy to plug in and use. To be available in August. 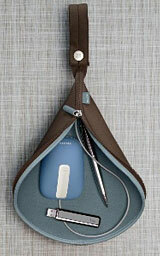 PR: Belkin's Mouse Trap zips up to carry a mouse and other small items around the house, for use with your laptop. Open it up and use it as a portable mousepad. Mouse Trap is perfect for moving from your bed to the couch to the dining-room table. Availability: Available now with launches in Asia, Europe, and Australia to follow. PR: The Proporta Protective Laptop Sleeve provides essential protection against scratches and impact damage, whilst storing your laptop safely away when not in use. Protect your laptop when you are on the move with this Protective Laptop Sleeve. Available in three sizes to best fit your laptop, the Protective Laptop Sleeve is suitable to fit devices measuring up to 13" (330mm), 15" (381mm) and 17" (432mm). Smooth to the touch, the Protective Laptop Sleeve combines contemporary styling with tough protection. 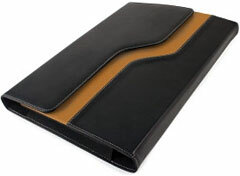 It includes elasticated sides which stretch to accommodate a wide range of laptop widths. The Protective Sleeve also has a nylon lining to protect your laptop unit from scratching caused on the move by knocks, bumps or loose items in your bag. PR: Targus Inc., maker of the world's top-selling notebook computer cases and accessories, has announced the latest additions to its women's line of notebook computer carrying cases. Created to appeal to the sophisticated flair of the female executive, the new Targus Bolero and Fandango Totes offer female executives a functional, yet classy and stylish choice for carrying their notebook computer, files and accessories while on-the-go. "We understand that women in business are looking for something that offers a combination of function with flair, an alternative to the traditional briefcase," said Al Giazzon, vice president of US marketing at Targus. "We designed our new carrying cases with female tastes in mind so they appeal to the fashion-minded, yet are practical and durable enough for everyday use." The Fandango Tote is elegantly designed and has the look and feel of a traditional purse. It fits notebook computers with a screen size of up to 15.4", includes a large removable storage pouch with wrist strap to store mobile accessories. It also includes a handy removable wallet. The interior is equipped with pen loops, a business card holder, key clip, additional pockets and plenty of storage space for files and documents. 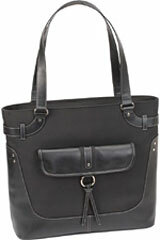 The tote is classic black and is constructed of durable polyester with handmade leather accents. It also features tapered fold down carry handles for a more comfortable fit, along with a classic striped interior lining and tassel detail on the front pocket for added style. The Fandango Tote measures 15.4" X 5.25" X 14.75" and is 2.87 lb. The Bolero Tote can be conveniently carried as a tote with short handle strap or over the shoulder with a longer strap so that it falls at the waist. The case fits notebook computers with a screen size of up to 15.4" and includes pockets for a cell phone, PDA or other accessories along with pen loops, an ID/business card holder and a large zippered compartment. The large zippered pocket and alternate side pocket with magnetic closure provide plenty of storage for accessing items quickly while on the go. Constructed of durable black polyester fabric, the Bolero Tote features a sleek and slim design perfect for business or casual use. The tote measures 16.2" x 4" x 13" and weighs 2.1 lb. Backed by as a limited lifetime warranty, the Fandango Tote is immediately available at leading retail and e-tail stores as well as targus.com for a suggested retail price of $89.99. The Bolero Tote will be available late August for a suggested retail price of $59.99. PR: Targus Inc., maker of the world's top-selling notebook computer cases and accessories, has added the chic Cha Cha Women's Tote to its line of notebook computer carrying cases, geared towards women on-the-go. Offered in stylish red, the new Cha Cha Tote provides a fun and fashionable alternative to the traditional black notebooks case. "We are constantly pushing the envelope when it comes to designing our line of women's carrying cases," said Al Giazzon, vice president of US marketing at Targus. "The Cha Cha Tote is perfect for women looking for a fun yet functional bag when traveling with their computer over the weekend or from meeting to meeting." The Cha Cha Tote is constructed of durable, red polyester material and features a decorative tassel and man-made leather accents for added style. It fits notebook computers with a screen size of up to 15.4" and the interior includes pen loops, business card slots, storage pouch and a large zippered storage compartment for papers or files. Female customers will appreciate the matching zippered pouch with wristlet for storing additional items such as keys or lipstick. 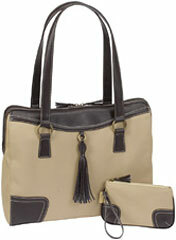 It also comes with tapered fold down handles giving it the look and feel of a purse. The product measures 15.5" X 4.75" X 13" and is 2.49 lb. Backed by a limited lifetime warranty, Targus' new Cha Cha Tote will be available late August for a suggested retail price of $69.99. PR: Slife Labs releases Slife 1.2, featuring several performance improvements and a new auto-update engine. Slife Labs is also giving away a MacBook on July 13th. In order to enter the drawing, all users need to do is purchase a Slife license for $34. Slife Labs announces the immediate availability of Slife 1.2. Slife is a new application for the Mac OS X that lets users visualize their computer activities, keep track of time and stay in touch with friends by sharing web sites they visit, videos they watch, applications they use and much more. Slife 1.2 features a new data model, optimized execution of plugins, improved support for any application and a new auto-update engine. "This release is mainly about performance", said Edison Thomaz, Principal at Slife Labs. "We've made improvements in all areas. Slife is faster to launch, uses less memory and consumes less CPU", he added. Slife Labs also announced that its MacBook giveaway continues. The company will be giving away one 13-inch 2.0 GHz White MacBook on July 13th 2007. In order to participate in the drawing, all users need to purchase a Slife license by July 12th 2007. A license costs US$34 and allows Slife to track an unlimited number of applications at a time. The drawing will be held on July 13th and the winner will be posted on the Slife Labs blog soon thereafter. Slife 1.2 for Mac OS X can be downloaded today. Slife can track up to 3 applications at a time for free and an unlimited number of applications with a license. A Slife license can be purchased for US$34. Slife 1.2 requires Mac OS X 10.4 (Tiger) or later and at least 512 MB RAM (1 GB RAM recommended). Streaming activities to a Slifeshare account requires Slife 1.0 or later.